Images make blog posts more appealing, that’s why we always use images on blog posts (at least one). But sometimes they increase the page loading time which is bad for SEO and readers. Search Engine Bots hate slow loading page and in the terms of readers, they don’t have much time to wait for the images to load. To minimize load time we have to optimize the image sizes before adding it to the post. We can do it by using many offline and online softwares. But the problem is it’s time consuming. That’s why WP Smush.it plugins comes up. 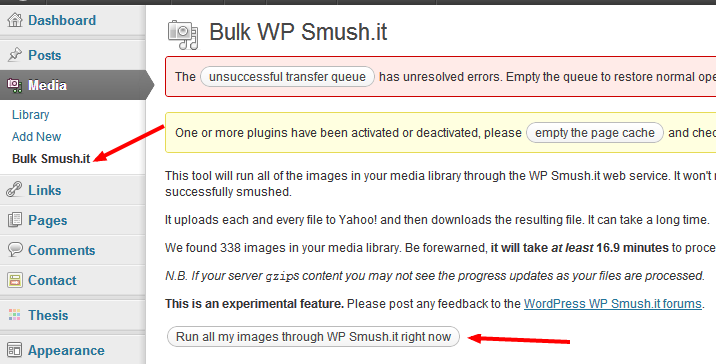 WP Smush.it is a WordPress Plugin that helps you to compress your existing or newly uploaded images without losing the quality. It has the ability to convert file from the GIF to PNG and deleting unnecessary data from images. Stripping meta data from JPEGs. The main task of the plugin is to compress the images and speed up your site. Every time when you upload to a new image, it will be automatically run through Smush.it. Then the size of the images will be reduced without sacrificing the quality. You won’t have to do anything else. Once you’ve activated the plugin you will get an option “Bulk Smush.it” under Media Section. To compress your existing images go to the Bulk Smush.it and click on ‘Run my all images through WP Smush.it right now’ . It will take several minutes to process the all images. Warning: If you have a lot of images on your Media folder, then you should not run all images at a time. It will consume huge amounts of resources of your server and your site may go down. Once the process is complete you can check how much bytes it saved from each images by visiting your Media gallery. Here is the screen shot of RoadToBlogging image gallery showing size reduction. You can also re-smush an image if you feel that the image is heavy to load. This plugin works great for me. So start using this plugin and make your site load faster. For a better site performance you can start using Free CloudFlare CDN. Let us know your experience of using this plugin. And share with us if you are using any other plugin like this. If you find this post useful, don’t forget to share it on Facebook, Twitter and Google+. You can uninstall the plugin without any worry. It won’t delete any files. Your smashed images will remain smashed. Hope it will decrease your page size. thanks for letting us know about it. have not tried it yet. Ya this is a cool plugin from the developer of yahoo. During bulk smush sometimes it got crash and many users have the same complain. I checked the forums and they were on the process of fixing this. Still this is a cool plugin and since this is from a trusted source like Yahoo, everyone should try this who haven’t optimized their images in posts. Very informative post. I think Yahoo has fixed it. I didn’t face any problem. But sometimes it takes too time to process if you have huge number of images in your gallery. This is a good plugin. But I don’t use plugin for reduce image size because I use image optimizer online tool to reduce image size :-) . You can use it for optimizing your old images I mean which are not optimized.